While the company, Xotic Effects, have grown as such, their pedals seem to have shrunk over the years. This is not meant in a bad way by any means, though. They simply leveraged the trend towards mini pedals and have nailed it big time in the guitar community. 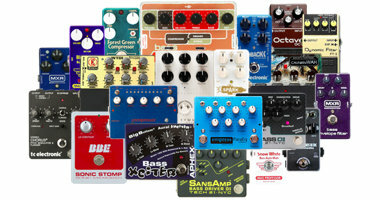 I love the fact that more and more pedal creators actually tailor some of their stompboxes for bass players, but I also remember the days when we as bassists had to search the guitar market, as it was more or less the only place to look for pedals and effects. On the surface, the SP Compressor is super simple. Just two knobs, a 3-way toggle-switch, an LED and the obligatory footswitch make up the clean and sleek user interface. The top knob is a BLEND control that allows you to mix the clean signal with the compressed sound. The VOLUME knob sets, well, the volume and apart from dialing in unity gain to compensate for the loss of level due to the compression happening, it has enough headroom to also give it a solid boost. The HI, LO and MID toggles-switch controls the parameter that is often called ‘Compression’ or ‘Sustain’ on many comp pedals. It basically defines how hard the signal is compressed, as you flick the switch back and forth. On the inside, you will find 4 dip switches that you can use to change a number of settings that is obviously meant to be set-and-forget parameters. Dip switch 1 and 2 work in conjunction to alter the ATTACK and RELEASE time. Note that each dip switch does not have its own exclusive parameter (e.g. 1 for Attack and 2 for Release), but as the graphics from the manual illustrates, the 4 possible combinations between the two dip switches gradually changes the way the pedal handles your sound from Low Attack / Long Release towards High Attack / Short Release. Dip switch 1 and 2 in the OFF position is the default setting when you first power up the pedal (unless you bought a used unit and the previous owner has messed with the switches – might be worth checking out if that should be the case). Dip switch number 3 functions as a HI CUT filter that you can simply turn either ON or OFF. As default it is switched to ON. 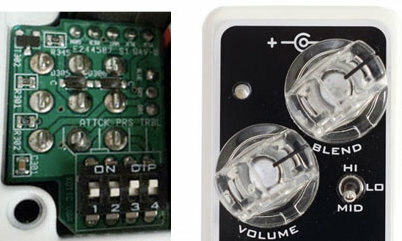 The fourth and last dip switch controls an INPUT PAD in order for the pedal to cope with high output pickups without introducing clipping at the input stage. I guess guitar humbuckers were in mind when Xotic designed the circuit, but in case you have an active bass with a very hot output, this could easily come in handy. By default, dip switch 4 is set to ON, which ironically means that it is not activated, but rather in ‘Normal’ mode. For a passive Fender Jazz bass this was just fine. 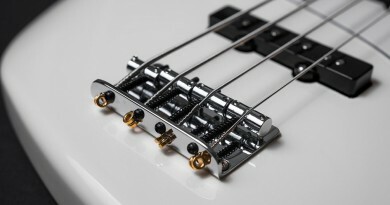 Xotic also states that when you switch on the INPUT PAD (in the OFF position…), a LOW CUT filter is kicked in, but reportedly this shouldn’t really affect your low end too much, as (I guess) the cut is well below your usual range, primarily dealing with ultra-low hum cycles. 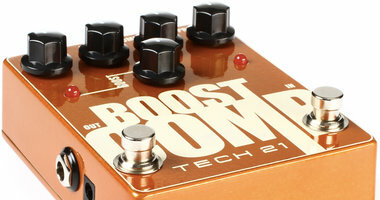 The Xotic SP Compressor is based on the classic Ross / Dynacomp concept like hundreds of other comp pedals on the market. That doesn’t mean they sound exactly the same, though. Not at all. Many of them also have a very different feature set. The classic design was a 2-knob operation, but with two different controls than what the SP Compressor offers. The fundamental tone and natural expression of a comp pedal is probably the first and most significant corner stone that just need to be in place, as everything else has to rest upon that. And in that respect, I found the Xotic SP Compressor in very good shape. The range is spot on to my likings, you can really create some subtle – almost inaudible – compression that just shapes your tone gently, but in a very pleasant way, and you can turn the BLEND knob all the way up and squeeze the tone hard, and still it sounds great. OK, it may become over-compressed if you do that and also choose the HI setting on the toggle switch, but overall I found, say, 95% of the available range usable for various compression tasks. Despite the limited hands-on control, I actually did find this pedal very versatile in terms of different tones you can create. The first thing you will notice when you pick up this tiny pedal is probably the weight of it. It is a mini pedal, though it is slightly higher than for instance the Mooer pedals or TC’s mini range, but this has created just enough space for Xotic to make room for a battery. Now, I am almost never running pedals off batteries anyway, but it could come in handy, should something happen to your external power supply mid-gig. Unlikely, though, but you never know. Obviously, if you remove the battery, the weight drops a bit too, but still, it is a heavy pedal considering its tiny footprint. Well, even though weight is not automatically a sign of good quality, in this case it sure does add to the feeling of a sturdy pedal that will take on most use and abuse and still survive for decades. Time will tell, but so far it seems promising. As for the visual design, I can’t help but being a little bit in love. The clear knobs in combination with the bright green LED (when punched in) just looks so great. That said, the narrow black lines on the knobs, indicating the settings, are harder to see from afar. I am a still debating myself whether or not it would have been better with white or black knobs, making the visual feedback of the settings more clear, or if the clear knobs just look so stunning that the lack of visual feedback is justified. I guess it’s up to each of us to decide. Now, the dip switch design is something that I obviously have to address. It seems to have become more and more common to have some additional options on the inside of modern effect pedals, and more options are always a good thing. The balance is of course if you decide to hide some of the vital parameters on the inside, forcing the user to find one fixed setting. On the one hand, top panel control over attack and release would have been great, but on such a small platform, compromises are impossible to avoid completely. At the end of the day, I hugely salute the fact that Xotic decided to make the BLEND parameter a key and easily accessible parameter. It is the key to make this pedal sound amazing, natural and true to your fundamental tone. And since the HI, LO and MID setting are tuned so nicely in, I wouldn’t have changed a thing in the design of this pedal. At the time of writing (2016), the street price for a new Xotic SP Compressor seems to have settled at around $130, which in my opinion is a very good price. 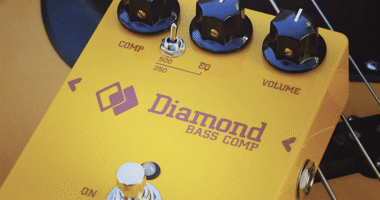 You can find a few cheaper compressor pedals that also sound great, but there are tons of others that are far more expensive, but don’t sound any better. They may offer more hands-on controls, which I guess would be the argument to look in that direction, but if you dig the core tone of this pedal, it’s more or less a steal and a no brainer. 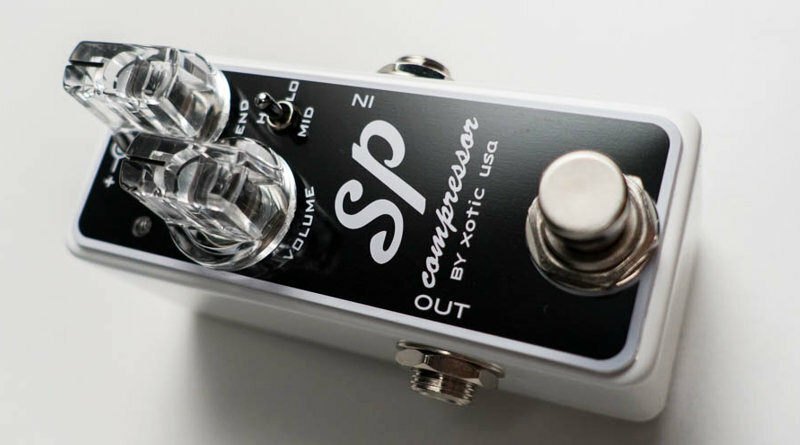 In my book, the Xotic SP Compressor is one of the finest examples of a pedal that has managed to find a golden sweetspot between features, size, tone and price. It takes up very little space on your pedal board, it offers a few controls (but the right ones), it sounds great, seems sturdy, looks amazing and won’t break the bank. 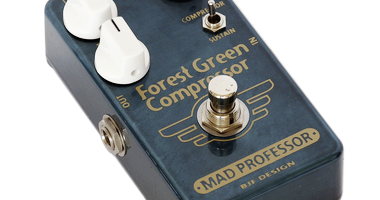 If you are on a quest for compression, you should definitely check out this little compressor gem.